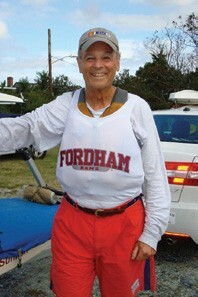 Joe Sullivan ‘58 was one of the early members of the Fordham University Sailing Team, and as the school’s Director of Sailing, his love for the team continues to this day. Forty years later, Joe saw a notice in Fordham Magazine urging alumni, who were varsity athletes and had not received an invitation to the Arthur Daley Memorial Dinner, to call the alumni office. He learned that the team had dissolved in the early 1970s, but the university shared a list of 80 former members. He sent out a mailing to see if anyone was interested in a reunion. It was held in February 1999 and the question asked by the 20 attendees was, ‘Why don’t we have a Sailing team today?’ A display was set up at the Club Fair in September and 102 students signed up, of whom 29 had sailing experience. That fall, former Commodore and MAISA President Charles “Bud” McEntee ’72 and Joe assisted seven undergraduates who were committed to rebuild the program. Sailing was recognized as a club sport, and Fordham was accepted as an associate member of MAISA in January 2000. For travel purposes, the university required that the team have a coach. None was available, so Joe volunteered to coach for a few months until someone could be hired. That was 15 years ago, and he’s still active in the program.